Epiphany Healthcare is proud to announce the top ranking for its Cardio Server as the “Category Leader” for ECG Data Management in the 2013 Best in KLAS: Software & Services report. 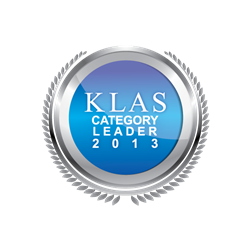 It is a profound honor to receive the KLAS award for the fifth year in a row. We believe it is a recognition of our unwavering commitment to the success of our customers. This year’s award marks the fifth consecutive year Epiphany has received the “Category Leader” recognition in ECG Management from KLAS. KLAS helps healthcare providers make informed technology decisions by offering accurate, honest, and impartial vendor performance information. Epiphany’s Cardio Server is a vendor neutral, multi-modality, intuitive management system that receives, manages, and exports diagnostic test results to EMRs. Cardio Server communicates with over 100 devices, from over 40 vendors, in 15 diagnostic modalities, consolidating individual device interfaces to the EMR. Physicians and other users access and edit ECG and other diagnostic test data from anywhere in the hospital, the office, or home using a standard web browser. Epiphany Healthcare simplifies diverse clinical workflow using one consolidated EMR interface. With over 500 hospital customers in the US and abroad, Epiphany is committed to serving its customers’ needs through product innovation, the delivery of exceptional service, and an unwavering dedication to interoperability. Discover why Epiphany is the preferred provider when managing multi-vendor, multi-modality diagnostic test data. For more information, please visit http://www.epiphanyhealthdata.com, follow Epiphany on Twitter (@epiphhealth), or Linkedin (http://www.linkedin.com/company/epiphany-healthcare). KLAS is a research firm on a global mission to improve healthcare delivery by enabling providers to be heard and counted. Working with thousands of healthcare professionals and clinicians, KLAS gathers data on software, services, medical equipment, and infrastructure systems to deliver timely reports, trends, and statistical overviews. The research directly represents the provider voice and acts as a catalyst for improving vendor performance. Follow KLAS on Twitter at http://www.twitter.com/KLASresearch.